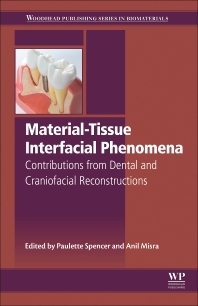 Material-Tissue Interfacial Phenomena: Contributions from Dental and Craniofacial Reconstructions explores the material/tissue interfacial phenomena using dental and craniofacial reconstructions as a model system. As the mouth is a particularly caustic environment, the synthetic and/or bio-enabled materials used to repair damaged tissues and restore form, function, and esthetics to oral structures must resist a variety of physical, chemical, and mechanical challenges. These challenges are magnified at the interface between dissimilar structures such as the tooth/material interface. Interfacial reactions at the atomic, molecular, and nano-scales initiate the failure of materials used to repair, restore, and reconstruct dental and craniofacial tissues. Understanding the phenomena that lead to failure at the interface between dissimilar structures, such as synthetic materials and biologic tissues, is confounded by a variety of factors that are thoroughly discussed in this comprehensive book. Since 2007, Dr. Spencer has been the Ackers Distinguished Professor of Mechanical Engineering and Director of the Bioengineering Research Center at the University of Kansas. She was previously a faculty member at the University of Missouri-Kansas City School of Dentistry (1998 - 2007) and is a Curators’ Professor Emeritus from the University of Missouri. Working with her research team, Dr. Spencer designs, synthesizes, and develops novel biomaterials for the reconstruction of mineralized tissues damaged by disease, age or trauma. Dr. Spencer has published more than 150 articles, conference proceedings papers, and book chapters. Dr. Spencer’s work has been continuously funded by the National Institutes of Health for more than 20 years. She has served as Mentor on 4 NIH-supported career development awards and as Director of a NIH-supported training program. She serves on several editorial review boards, is a past member of the Center for Scientific Review, NIH (2010 - 2012), and was Visiting Professor at the Bauru School of Dentistry, University of Sao Paulo in 2009. She is a Fellow of the American Institute for Medical and Biological Engineering, the Biomaterials Science and Engineering International Union of Societies for Biomaterials Science and Engineering, the American College of Dentists, and the American Association for the Advancement of Science. Anil Misra PhD is Professor of Civil Engineering and Associate Director of the Bioengineering Research Center at the University of Kansas, Lawrence. He was previously Professor of Civil Engineering at the University of Missouri-Kansas City. He has more than 25 years of experience in the area of granular micromechanics, multi-scale modeling and micro-macro correlations, constitutive behavior of interfaces, e.g. material/tissue interfaces, granular soils, and cement/asphalt concrete, and multi-modal material characterization using high-resolution techniques. He has co-edited three books and guest-edited four journal special issues. He serves as a reviewer for multiple journals, extramural funding agencies and also provides consulting services to industry.